Sinus problems affect many people and can cause a lot of pain and discomfort. Medication is one option to get sinus relief but a lot of people prefer a more natural way to treat the condition. Neti Pots offer natural relief for a very reasonable price. Roanoke Valley ENT & Allergy wants our patients to be educated about the use and safety of Neti Pots. 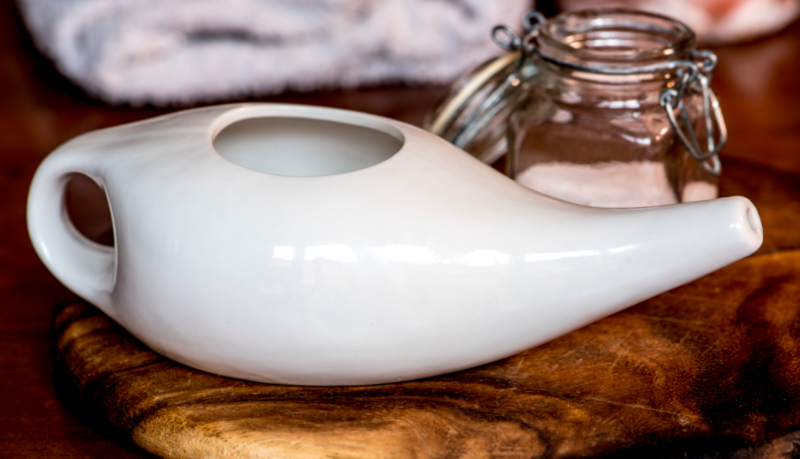 Neti Pots come in many forms and materials but most resemble a teapot like many of us have in our kitchen. They originated in ancient medical practices and use irrigation of the nasal cavity with salt water to treat sinus symptoms. You can buy one online or at most drug stores and large retailers for under $20. They provide natural sinus relief for a low price. How Do They Work and How Do You Use Them? Neti Pots rinse out your nasal cavity with a saline solution. This helps get rid of thick mucus that eventually ends up in your throat or nose. You simply tilt your head at an angle, pour the saline solution through the spout in one nostril and blow out the other nostril. As the solution goes through your nasal cavity, it makes the mucus thinner and easier to pass which reduces sinus symptoms. At first, it feels weird but once you use them a few times it becomes much easier. Neti Pots used the correct way are very safe. The two main things you must remember are to keep your Neti Pot clean and to use the correct type of liquid to rinse your nasal cavity. When cleaning it, use distilled water or boiled water and just a little soap. Scrub the pot thoroughly with a brush including the lid. Some pots come with salt packets you can mix with distilled water or you can make your own saline solution with recipes available online. The biggest danger comes from using tap water instead of distilled water. Recent cases of illnesses have been reported due to using tap water in Neti Pots. If you follow the instructions that come with the pot, you shouldn’t have any issues. Neti Pots do offer an alternative to medication for sinus relief. If sinus problems affect your quality of life, Roanoke Valley ENT & Allergy will work with you to find relief. Our team of medical professionals are highly skilled in the diagnosis and treatment of sinus issues. For an appointment, contact us at (540) 968-7368.